Tuesday was my first outing to the Farmington river this year. It was a trip that was late to come this season due to the high water flows. With the conditions checked on the computer I felt it was going to be a good day. When I left home there was a slight drizzle but as I drove closer to where I was to fish the skies opened up and monsoon time. The guessers claimed it would stop soon so I waited in the car. You know what it didn't stop but returned to that slow drizzle. I was at the river and a little drizzle was not going to stop me from fishing. I geared up and was soon in the river. I'll tell you right off I did not care fro the flow, for me it was to high and I did not feel comfortable. The plan now was to fish close to the bank where wading was safe for me. It did not take long before the wet fly to find a willing combatant. The river produced several brookies along with a rainbow that took a streamer and after using it for a spell spit it back at me. Farmington river brook trout are somewhat subdued in their colors, but they are fighters. The sun started to break out and with that I decided to do the same, break out to a small stream. Here is where I feel right at home. The boulders, the little plunges, and that beautiful tea colored water. The stream was productive though most of the fish were small and could not take the fly. I did manage to get one to take and it was a perfect wild jewel. It will be awhile before I go back to the Farmington, it has to come down some. No loss though for I have places like this to spend my time. I take a daily walk of approximately three miles. I'm usually out there about 7-8 am except when I'm fishing. My walk takes me through lovely small town streets with those cute little houses. The town does have it's "biggies" but where I live it's "old school" and much more modest. About the last mile or so I walk along two sections of undeveloped land which is on both sides of the street. This section is not big in the sense of large preserves but the main thing it's protected. In the years I have walked this route I have observed hawks to sparrows and almost every other bird, most of which I can't identify. Many times I have observed deer, coyotes and foxes, those red fox in late autumn and early winter are so beautiful. And my favorite friends along this stretch are the wood-chucks. They enjoy the grass of which there are many types. Now this area does not come cloes to large tracts of land about such as Maine's 100 mile woods or the Adirondack Park in New York, but in it's small way it is a sanctuary that's doing a vital job. The Red Sox, my favorite baseball team. This hat has been with me for some time, and recently I have been wearing it when I fish. My usual cap "Cakskill Flies" is in sad shape and in need of replacement, so I use the Sox cap. Well it has brought me luck and I may just keep it in the capacity....more later. Let me reintroduce you to one of the, "take that back" the best fly rod ever produced. The Orvis Superfine Small Stream Special. I bought this rod back in 1990, brand new from the Orvis factory. I have fished this rod on big rivers, Salmon River NY, Androscoggin River NH, The Magalloway in Maine, The Delaware River in Pennsylvania and The Farmington River in Connecticut. 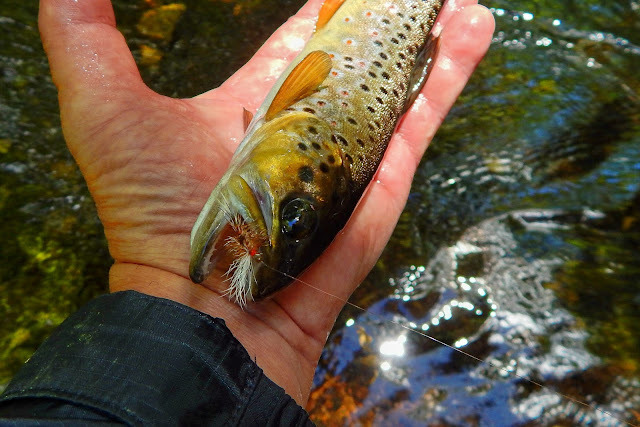 The rod has seen countless hours on the small intimate streams of the northeast. It has accounted for Great Lakes salmon and brown trout, landlocked salmon, and brook trout and most every other type of fresh water fish, and not to be forgotten it's also taken it's share of sea-run brook trout. I wish Orvis would come back with this rod. I hope to put the Small Stream Special to work soon. "Natives"..not brook trout but those fine vegetables and fruits that are local. I am very lucky to have two very good farms within a couple of miles of home. One of the farms I visited the other day has lots of native produce on sale right now. I saw these beautiful yellow summer squash and picked up a few. This can be steamed or sliced and baked with seasoned bread crumbs. I got to talking with the owner and was told that the native sweet corn would be available around July forth. Corn is one of my favorite summer veggies. "Got Sausage"....if not make some. I had some country style pork ribs in the fridge. I took them out and removed the bone. Then took a knife and cut them into the desired size. There is no need to grind the meat especially for this amount. Then some simple seasonings, salt, black pepper, crushed red pepper, and a drop or two of wine. Fennel seed can be also added, some like it and others find it undesirable for various reasons. Get yourself a handful and form patties. Grill them crispy in some spots for that distinctive flavor and texture. When done serve along side a hot pepper and a salad and "wow"...they are also great for breakfast. "Moxie" if you have not tried this drink please do. It is a favorite of mine. The more I delve into these North Country Flies the more I'm liking them. These patterns were created centuries ago and my goodness they work. The simplicity in tying them is beyond words, like the commercial say's even a caveman could do it. The fly pictured is a Partridge and Blue, or sometimes Blue Partridge. Tied back in the 1800's. Blue silk body with sparse mole dubbing and partridge hackle. The colors don't suggest a natural insect, well yes it does. The insect is a sand spider, and they are often found in sandy sections of streams. The fly is best used in the months of April, May and June. Over the past few months I have fished the fly in various streams along sandy sections. And just as the book said, the fly worked perfectly. The light colored brook trout, as they hang out in the sandy bottom. "Camo"
In this run as I worked that Blue Partridge along the bottom an ample amount of trout hit the fly. Brookies, Snow Balls, And The "Conover"
Yesterday was Father's Day and one of the nice things about this day is the fact that there's not much resistance from other parties to the thought of going fishing. Permission granted and I was out the door. I headed to a stream that has in the past been good to me in terms of fishing action. When I got there I found tumbling water and plenty of it. While gearing up I could already feel the humidity, that nasty clammy feeling. The clouds were hanging on but the forecast was for some sun to break out, which may not be helpful in terms of feeling good. The mountain laurel is in full bloom, like snow in the mountains, and a prettier sight is not possible...well maybe. This is the "well maybe"...wild brookie on a dry fly....a dry fly that would work very well today. A typical Connecticut freestone stream. Lots of rocks to hop and dodge. Behind some of those rocks hold fish like this one. "The Conover" a Catskill fly that got a lot of attention. This fly was tied with ginger hackle, but now I have in my possession the golden badger hackle this pattern requires. The dubbing is home-made. There is a nice little story behind this fly... I'll tell you about that later. I never get tired of views like this. One thing we all have in common. The Neversink Skater, a fly I fell in love with the first time I saw one in the book "Land of Little Rivers". It was a pattern created by Mr. Ed Hewett. I try to tie it as close to the original pattern but it's not quite the same....but it works just fine. This is the second year that I have been fishing it and the more I learn about how to present it the better I get at fooling trout with it. The last few outings I have fished this fly almost 100% of the time...here is one of those outings. This fly works well in riffled water and pools. This wild jewel took the Skater in a glass clear sunlit pool...it was skated across the pool and he chased and struck it twice. This is a prime place to work the Skater. As it neared the log jam the fish came straight up and nailed it. Drifted along the edge, or the seams and then twitched it becomes something a trout can't resist. On an outing that happened last week, or there about I encountered some beautiful wild trout. These fish were willing to take a dry fly, and the ones that actually rose to the fly I was able to bring a pair to hand. The morning was gorgeous, sunny, not to warm, and a slight breeze. In these times I truly like a little wind for it keeps the insects at bay. The fish were found in almost all areas of the stream, riffles, pools and along those fly stealing undercut banks. On this day only one fly was listed as MIA. A wild brown, the first to come to hand. The photo really depicts what this blog is named for "Small Stream Reflections"....look how beautiful the trees, clouds and a bright blue sky are reflected in the water. Now say to yourself, wow what I could be enjoying. In one of those little seams in the stream my fly was viciously ripped at. I was quick and a hookup was solid. The fish was strong and did not give up easily. One of my better small stream browns of this year. He was released to battle another day. The Ausable Bomber was the fly that was responsible for the trout taken today.....thanks Fran.